Pepe Julian Onziema's in-depth interview on Last Week Tonight With John Oliver won a GLAAD Media Award for Outstanding Talk Show Episode on Saturday. 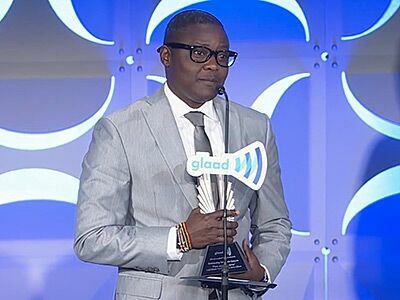 Pepe Julian Onziema, a leading activist for LGBTI rights in Uganda, took home a well-deserved GLAAD Media Award for Outstanding Talk Show Episode on Saturday at the 26th Annual GLAAD Media Awards in New York City. Onziema — who has been profiled in The Advocate's award-winning coverage of Uganda — accepted the award for a thoughtful, wide-ranging interview on HBO's Last Week Tonight With John Oliver last June. "This is a very, very profound moment for me, on behalf of many LGBTIQ Ugandans and Africans," Onziema said Saturday, taking a moment to collect himself. "I'm deeply, deeply humbled to be here, as a trans man, transitioning in Uganda, and standing firm to fight for LGBTI human rights." The award was presented to Onziema by the out star of Fox's musical drama Empire, Jussie Smollet, at the celebration held at New York City's Waldorf-Astoria. The annual awards from the media watchdog organization celebrate TV, film, multimedia, and news presentations that portray LGBT people fairly and accurately, to make a difference in how the community is represented in media. "This episode is not just watched in the states," said Onziema, after recounting his initial hesitance to work with additional Western media after years of so-called helicopter journalists not telling the full story. "Back home, it's changed minds, it's had the media back home addressing me by the right pronoun — it's had one of the local media critics in Uganda writing a whole blog about it and constantly saying how much he respects me." Watch Smollet's introduction (with a shout-out to Laverne Cox) and Onziema's acceptance speech below, via GLAAD.